This was a wonderful way to see Tokyo. Gaku is a friendly, informative guide that took us to most of the major sites by doing a 32 km circle from Shinjuku and back. We bought a bento box at the supermarket and ate outside at Tokyo Bay, the tour concluded with a trip up to the top of the Metropolitan Tower to see all the places we had cycled. Traffic wasn't a problem. Highly recommended. Had a brilliant tour peddling around Tokyo under the expert guidance of Gaku and was amazed how much we got to see. The bikes are excellent, the pace is nice and gentle and we had lots of ‘wheely’ good fun in the process too. Gaku is a excellent guide and explained things succinctly and informatively, which made for an all the more memorable trip. Un parcours en vélo tres agréable avec le sentiment d'etreen sécurité avec a la clefs pleins de visages de la ville. A recommander. What a great way to experience Tokyo. It was fun cycling through the streets, parks and cemeteries and our guide was great. Sensible, funny and safe. AWESOME! 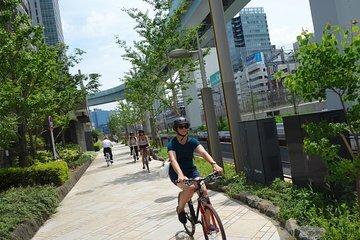 GO SEE TOKYO ON A BIKE! Gak, tour guide, was great! Knowledgeable about Tokyo, well seasoned in his years of cycling and bike safety, upbeat and super friendly, welcoming and happy to have me spend the day with him. What makes this bike tour different than another? Well, Gak the tour guide, for one. But even if you do not get Gak, this tour puts a maximum of I think 5 people per tour which makes it more intimate to navigate on a bike this big, fast paced, cool city. Any more and there would be too much to manage, for all on tour, I would think. I have been to Tokyo before and have seen all the major tourist spots. I was interested in this tour in order to see Tokyo from a different vantage point. Seeing the sights of this spectacular city, taking in the smells of the city streets, feeling the pulse and DNA of Tokyo while peddling along for 20 miles over 7 hours was a great new way to experience Tokyo, all while getting in some exercise in my day. Once the bike tour company knows your height, they will have a bike and a helmet for you when you arrive to start the tour. You start and end the tour in the same spot. The tour would cater to all levels, but know you are cycling along the busy city streets with traffic and along the foot paths with people. As long as you can ride a bike and can last a 7 hour day on bike and on foot, you'll be fine. Tokyo is flat, so there are very few inclines along this route that will take you to about a dozen spots including shrines, temples, scenic places and tourist attractions. You cycle for 10 minutes, stop and walk around the destination spot for a bit, then hop back on the bike and cycle again to the next stop. This tour is more cycling and seeing and generally less feeding you info although Gak was quick to answer any and all questions. The shortest time on the bike is probably 5 minutes point to point and the longest time was probably 30 minutes point to point with a stop in the middle to buy water. It is one giant loop around Tokyo. Cycling through the beautiful Aoyama Cemetery was a personal highlight to me. It houses about 40,000 guests and is so peaceful, lovely and calming to be cycling through, it is almost beyond words. Also, sitting outside and eating our lunch along the Waterfront at the Takeshiba area was really nice lunch not included, but you pick out on your own from a grocery store you cycle to along the route and then Gak carries in his pack for you! . Both of these experiences were off the beaten path of tourism a bit and thus I think why I enjoyed. I am an athlete and pretty adventuresome, so this tour was a good fit for me personally. I did a few tours off Viator on my trip to Tokyo and by far this was one of my favorite. Gak is very funny and knowledgeable and passionate about biking. This tour was one of the highlights of my trip which allows you too really see a lot of central Tokyo. The bikes were also in great shape! PS: Gak is a professional mountain biker - He started this company with the belief that the best way to really get a feel of a city through biking. This is from his own personal experience. One of the best bike tours I've taken. I've done bike tours in both Paris Monet's Gardens and Rome and now this one in Tokyo with Gaku, our guide. Viator does fantastic bike tours and Gaku is one of the best guides! You must do this tour if you are even thinking about it a little bit. First class. The tour is highly recommended. Gaku the guide is very good. He'll talk to you personally, about the locations to the group of which there are a few but he'll understand if you're struggling. We had to stop as a member was struggling so went into a local place for water. Gaku brought the guy a drink and everyone else a class of water. The day was too hot for cycling. The tour was very good. It went to some places that coaches simply couldn't go but also to the main Tokyo places. The cycling was 15 miles but about 3 miles walking total at each place that we visited. I have seen areas of Tokyo which a normal traveller will never see. Highly recommended. It is a few hours of cycling but normal fitness level is sufficient. Great experience! The bikes are high-quality and in good shape. Mid-April gave us perfect cycling weather, the roads in Tokyo are well maintained hardly any cracks or potholes, and the slopes are very gentle. The traffic gets pretty dense at times, but the drivers are polite and give you enough space. Gaku is a good guide and can tell you a lot about the sights you'll see. He's also very skilled at taking photos!